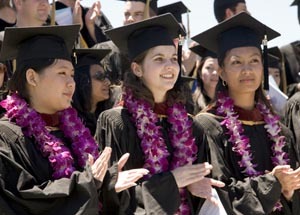 A new writing requirement will help prepare UCSC graduates for the job market. Photo by Jim MacKenzie. Before they graduate, students at UC Santa Cruz will receive high-level writing instruction tailored to their field of study, preparing them for the demands of an increasingly professional workforce. UCSC faculty unanimously approved a proposal to enhance undergraduate education by requiring students to acquire five credits in writing-intensive classes appropriate to their academic discipline during their junior or senior year. This is in addition to writing-intensive core courses students are required to take as frosh and sophomores. "Students understand that they need to write well in order to succeed, and potential employers are very clear on the importance of good writing," said linguistics professor Jaye Padgett, who shepherded the proposal as chair of the Academic Senate Committee on Educational Policy. The review of UCSC's general education requirements has been underway for two years. The new upper-division writing requirement builds on two mandatory composition classes that students take during their first two years. It replaces another writing requirement that lacked the upper-division and discipline-based elements of the new initiative. To satisfy the new requirement, upper-division students must take one to three writing-intensive courses applicable to their major and totaling at least five credits. From art history and biology to anthropology and engineering, each academic department will tailor courses to convey the reasoning and communication skills essential to success in specific disciplines. Although the new "disciplinary communication," or DC, requirement will focus mostly on writing, some courses will incorporate other forms of communication vital to specific disciplines, such as oral presentations or poster presentations, noted Padgett. "Departments will ensure that students have courses unique to their field of study," said Padgett. "The faculty of each department will determine the writing needs of their majors." At the Academic Senate meeting, undergraduate student leaders endorsed the proposal, saying an influx of upper-division writing courses will benefit all students. The UCSC Alumni Association Council at its winter meeting approved a resolution supporting the new disciplinary-writing requirement, heralding it as an important component of academic excellence and an expression of the campus's longstanding commitment to strong writing and communications instruction. Support from alumni, foundations, and corporations will be sought to further enhance the comprehensive writing and general education program, said Donna Murphy, vice chancellor of University Relations. "The outpouring of support for this initiative has been truly remarkable," said Murphy. "We are partnering with faculty to take writing instruction at UCSC to the highest level. This initiative will ensure that our graduates are among the best-prepared for the workforce and the opportunities of the 21st century." The new graduation requirement takes effect this fall.